029. ASTROLABE. Issued by Sanitarium Health Food Company, Auckland, New Zealand (Date?). No. 13 in a set of 25 cards titled "Famous Ships in History". Size: 3.4+" x 2.3+". Recto: Color painted view of the Astrolabe with men on ice floes. Title in lower right corner: Astrolabe. Verso: FAMOUS SHIPS IN HISTORY | A SET OF TWENTY-FIVE CARDS | (No. 17) ASTROLABE, 1826 | The first voyage of Dumont D'Urville to New Zealand in 1826-27 has long been recognised as of outstanding historical importance. His passage of French Pass being most notable. 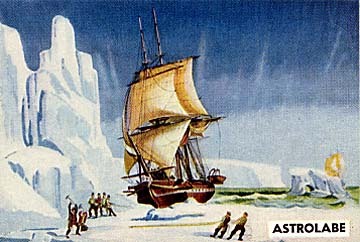 D'Urville in the Astrolobe accompanied by the La Lilee also explored the Antarctic in 1837.